For by one sacrifice he has made perfect forever those who are being made holy (Hebrews 10:14 TNIV). It's happened 20 times in history. But it should be 21. "It" is a perfect game in Major League Baseball. Since June 12, 1880, when Lee Richmond of the Worcester Ruby Legs retired all 27 Cleveland Blues batters without any of them reaching base (on a hit, walk, hit batsman, error, or for any other reason), only 19 other pitchers have managed the same feat. Those who have done so go down in history as someone special. The list reads like a pitching hall of fame: Cy Young, Addie Joss, Don Larsen, Jim Bunning, Sandy Koufax, Catfish Hunter, Len Barker, Kenny Rogers, David Wells, David Cone, Randy Johnson, Mark Buerhle, and Roy Halladay. There should be one more name on the list: Armando Galarraga. 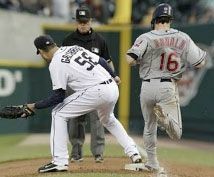 Galarraga, of the Detroit Tigers was perfect through 8 2/3 innings Wednesday night, June 2, against the Cleveland Indians. Twenty-six batters up, twenty-six down. The atmosphere in the stadium was electric, a buzz building as Cleveland's Jason Donald came to the plate. Donald slapped a sharp grounder into the hole between first and second base. It's an easy play, one professionals can execute in their sleep. While the first baseman fields the ball, the pitcher runs over to first and the first baseman tosses him the ball for an easy out. It happens several times in most games. It went exactly like it should have this time, too. Tigers first baseman Miguel Cabrera fielded the ball cleanly. Galarraga was in position. Donald is fast, so there wasn't a lot of time, but Galarraga beat him to the bag, ball in his glove, by at least a step. All the replays showed it. And first-base umpire Jim Joyce was right there, in perfect position to make the "out" call and touch off a celebration. "It was the biggest call of my career," Joyce would say shortly after the game. "I just cost that kid a perfect game," Joyce said, tearful in the umpires' locker room later. Joyce thought Donald beat the throw, that's all there is to it. He sees the same replays as everyone else now, and knows he missed the call. But when it happened, he seems to have truly thought that Donald beat the throw. Maybe it was the way he was standing, the angle at which he was looking at the play, but he says he was "convinced" that the baserunner was safe. As the boos built to a crescendo and everyone in a Detroit Tigers uniform got in his face, it became clear he was the only one in the stadium who thought so. And when he saw the replays, he knew. He knew what everyone else knew. He had so monumentally blown a call that he will probably be remembered for it as long as there is baseball. It's hard to be perfect. Ask Armando Galarraga. Ask Jim Joyce, if you need to. But I'm guessing you don't need to. You already know, don't you? You've worked hard, done everything right, and still failed, haven't you? The victim of a blown call or a bad break? And probably at least once or twice, you've blown something so monumentally that you really doubt anyone will ever forget it. Your Lord has chosen to call us perfect! In Christ God has made us perfect. That's the shocking use of tense in Hebrews 10:14: he has made us perfect. That's called the perfect tense, appropriately enough, because it signifies an action completed in the past that has ramifications for the present. And that's what the writer means. He's not saying that because of Jesus we can never make a mistake. He's saying that Jesus has made us complete. He has brought us to the place we needed to be. Everything that needs to be done to save us and redeem us is accomplished in him. But that's not all. We've been made perfect, but we are being made holy in Jesus. Again, it's God's work. He's the one who separates us out from the world so that we'll be fit for his purposes. And that's ongoing. That's where the places where we don't look too perfect are dealt with. In the process of making us holy, God confronts our selfishness and sin. He reminds us that we are his and that our purpose is nothing more or less than to be living temples from which his glory shines. You want a small measure of redemption in Armando Galarraga's blown perfect game? It comes in the way everyone has conducted themselves since. Galarraga walked backed to the mound with a pained smile, shaking his head, while his manager and teammates argued with Joyce. He quietly went back to work, and retired the next batter to win the game. Jim Joyce saw the replay, and then asked Tigers manager Jim Leyland for permission to talk to Galarraga. They hugged, Joyce cried and admitted he was wrong and told Galarraga how sorry he was. "You don't see an umpire after the game come out and say, 'Hey, let me tell you I'm sorry,'" Galarraga said. "He felt really bad. He didn't even shower." So Galaragga's probably had more pleasant hugs. That aside, though, he said he respected Joyce for admitting his mistake. Since they couldn't be perfect, Armando Galarraga and Jim Joyce did what we're all supposed to do when imperfection inevitably rears its head. They admitted their mistakes, and they apologized, and they forgave. And then they went back to work. They have chosen not to let imperfection define them. Your Lord has chosen to call us perfect, too. Not because we deserve it, but because the work he's doing in us can't be stopped. He's refused to let imperfection define who we are, and gave his life to prove it. Though he could have chosen to dwell on our sins, he chose instead to go to the wall to make us perfect and holy. So we should feel free to come before God as his children (Hebrews 10:21). And we should hold on to our hope, rising as it does from a faithful God (Hebrews 10:23). We should push each other to love better and do good more (Hebrews 10:24), and we should avoid deliberate, high-handed sin (Hebrews 10:26). In Christ, the issue is settled. The conflict is over. As long as we're in him, you and I are perfect, and nothing anyone can say or do, and not even our own failures, can change that. Anyone who would say otherwise is, well, off base. "Perfect!?" by Patrick D. Odum is licensed under a Creative Commons License. Heartlight encourages you to share this material with others in church bulletins, personal emails, and other non-commercial uses. Please see our Usage Guidelines for more information.